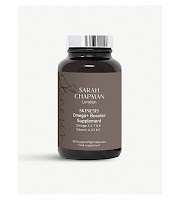 Sarah Chapman delivers highly effective treatments and products founded on cutting-edge clinical research- these supplements take her skin care regime from the inside. Whether you’ve paid a visit to Sarah Chapman’s Skinesis clinic in Chelsea or not, you can take control of your skin. The combination of active vitamins, minerals, antioxidants, coenzymes and omega oils in these supplements is your ticket to reducing signs of fatigue and stress, while also helping cell repair and rejuvenation. 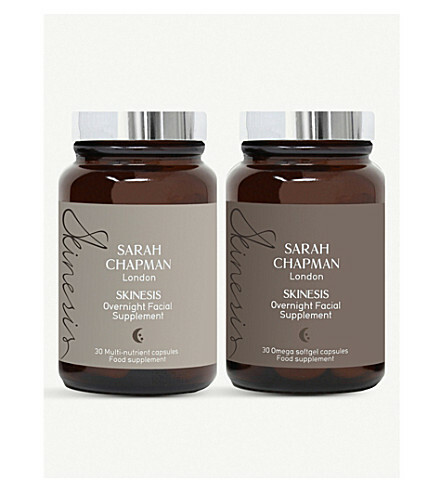 Whether you’ve paid a visit to Sarah Chapman’s Skinesis clinic in Chelsea or not, you can take control of your skin. The combination of active vitamins, minerals, antioxidants, coenzymes and omega oils in these Overnight Facial Supplements is your ticket to reducing signs of fatigue and stress, while also helping cell repair and rejuvenation. Plus, lavender, hops and magnesium help you sleep soundly. Take one before bed to let it work its magic overnight. A hectic lifestyle can take its toll on your skin. When you’re losing the battle against sensitivity, Sarah Chapman has the answer in these Omega+ booster supplements. Formulated to strengthen, nourish and support, it restores suppleness, flexibility and, best of all, that coveted natural glow. It’ll result in plumper, more resilient skin that’s well-hydrated with omega oils and nourished with Vitamins A, D3 and E. Better take four a day.